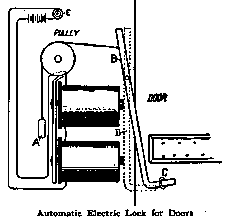 The illustration shows an automatic lock operated by electricity, one cell being sufficient. When the circuit is broken a weight, A, attached to the end of the armature B, tends to push the other end of the armature into the screw eye or hook C, which is in the door, thus locking the door. To unlock the door, merely push the button E, The magnet then draws the armature out of the screw eye and the door is unlocked. The dotted line at D shows the position of the armature when the circuit is complete and the door unlocked. The weight must be in proportion to the strength of the magnet. If it is not, the door will not lock, or would remain locked. The button can be hidden, as it is the key to the lock. --Contributed by Claude B. Melchior, Hutchinson, Minn.